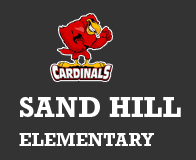 It is with great enthusiasm that I welcome you to the Sand Hill Elementary School website. I am confident that you will see that Sand Hill is a special place for children to develop and learn! I encourage you to take part in class activities and school events. There is an overwhelming sense of collaboration and dedication at our school, which we would like to share with you. We are committed to doing all we can to make school a successful experience for every student. We firmly believe that a home to school partnership is necessary for the success of all of our students. On behalf of everyone at Sand Hill, have a great year!